Today I traveled to Atlanta, Georgia, by way of The Atlanta Constitution dated July 7, 1914. There I found that Andrew Carnegie was being extremely generous… “Carnegie Willing To Endow Library In Every County”. He was going to be donating between $75,000.000 and $100,000,000 to establish libraries in country districts. “…He is determined to give his money away and die poor, and here is an opportunity. Seventy per cent of the people of the United States still are without access to good libraries…”. The front page also has a headline “Young Swimmer, Who Wore One-Piece Suit at Piedmont, Dares Dangerous Hell Gate”. 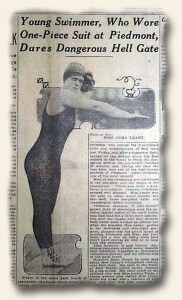 This shows includes a photo of Miss Nora Leahy in a sleeveless, skin-tight garment… which the year prior men were not even permitted to wear suits with sleeves less than an inch in length. My how far we’ve come! Is modesty based purely on cultural norms and/or expectations, or are there certain absolutes – 3rd world regions aside?